1🚂)The passengers are required to give the option for being considered for upgradation at the time of ticket booking. If no option is given at the time of filling up of requisition form, the same is treated as "yes" and passenger(s) are considered for upgradation. on random basis by the system at the time of preparation of reservation charts, according to Indian Railways. 3🚂)Only waitlisted passengers are provided confirmed seats under this scheme. The remaining vacant berths are transferred for booking on the current counters as per the existing practice. 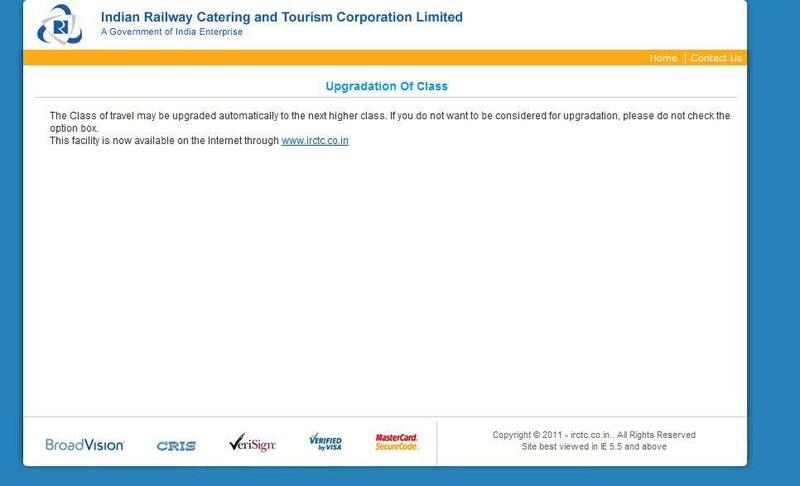 Thus, if there is no waiting list on a train, no upgradation takes place, according to IRCTC. 4🚂)All passengers in one PNR (Passenger Name Record) are upgraded together. None of them will be upgraded in case of non-availability of enough berths for upgradation. 5🚂)Original PNR of upgraded passengers remain unchanged and all information from PRS are provided when an enquiry is made with the original PNR. 6🚂)The berths of confirmed passengers, who have been upgraded to the higher class, are allotted to the RAC (Reservation Against Cancellation)/WL (Waitlisted) passengers of that class. If there are still some berths vacant, the vacant berths are allotted to confirmed passengers of the next lower class, according to IRCTC's website. 7🚂)If a passenger, who has been upgraded, cancels his ticket, cancellation charges of the original class is only payable. 8🚂)The final charts of the upgraded class include the names of upgraded passengers against their allotted upgraded coach and berth number and have an indication denoting their upgraded status. 1. Is exercised for those passengers only who have opted for upgradation while booking (complaints are there that it was done without exercising (226509) but it sure that the System had already fed into information of this option having been opted for) . applicable to all the issuing gateways - Counter, E or I. 3. Is applicable to all the status whether CNF, RAC or W/Listed before chart preparation (or at the time of issuance of original booking) and whether Tatkal or General. 4. A complete PNR is upgraded and not less than all passengers out of a PNR. 5. Next higher class is only to which GENERALLY upgraded (exceptions are there which have previosuly been reported at our site where next to next higher class was allotted). One can refer to the upgradation list of Yesvantpur-Howrah Duronto Express/12246 of 25.08.2011 where 41 passengers are upgraded. At Sr. No. 11, one can find that a passenger of 3AC has been upgraded to 1A (Blog Entry No. 226690). 6. Is automated on random logic & hence no preference can be set (earlier booked, Tatkal booked, initially confirmed or so). 7. There is no compulsion that Upgradation will be applied by IR for any train irrespective of some berths being carried vacant in a class. 8. There is no charge for Auto-upgradation and the passengers enjoy the upper class journey just free of cost though in upper class, there may be an additional costing in addition to empty haulage like bed rolls (when upgraded from SL to 3AC or so) and Pantry costing (like 2AC to 1AC in Rajdhani / Duronto or ACCH to ExCH in Shatabdi trains. 1. Sr.Citizens, Ladies who are prefering Lower Berths and are expecting (or know) that they are likely to get LBs, should not allow upgradation if they need LBs only. 2. Sleeper class passengers who do no like Air Conditioning, should not allow upgradation. 3. Beware that good allocation in the original class may become bad in the higher class (a reverse is also possible). Attached is the upgraded Passenger List for 12956 (Jaipur – Mumbai Central via Sawaimadhopur – Ratlam – Vadodara) of 24.08.2011 which copy pasted for summary viewing and screen Shots pasted for original effect. 1. Upgradaing is only one class upward (though sometime back we had received notice from some members that it had been beyond one class up also). 2. Sr. no. 1, 8 etc. were waitlisted but have got upgraded. 3. Sr. no. 13, 15 etc. were under RAC but have got upgraded. 4. Sr. Nos. 2 to 5 were enjoying a good allotment of original berths (B-4> 17, 18, 19 & 20; 3rd cubical LB, MB, UB and LB) but on upgrading they have been bifurcated to A-1> 41, 42, 43 & 44; SL, SU, next cubical UB, opposite LB). 5. Sr. Nos. 25-26 and 37-38 had all Lower berths inside same cubicals (S-2> 1 & 4 and S-9>65 & 68 respectively) which seems to be for Sr. Citizens or Ladies (Just prsuming, pls.) but have been thrown away at SL and SU berths (B-5> 47 & 48 and B-5> 15 & 16 respectively; one side lower and one side upper each). 6. Sr. Nos. 45 & 46 have badly been treated. Enjoying berths 1 & 4 (both lower, same and first cubical) in S-8 are picked up and dropped off at both the upper berthe (19 & 22) in coach B-3.